On January 6 the North Korean government announced via Korean Central News Agency that it had conducted a hydrogen bomb test the previous day, building on comments made by DPRK leader Kim Jong Un in December 2015 that the North had perfected the hydrogen bomb. Significant as the advancement of Pyongyang’s nuclear weapons program is, however, it represents only one part of a broader human security narrative driven by processes of transformative social change. While Korean Peninsula nuclear politics remains an important strategic issue, the contours of the situation have remained relatively predictable for over two decades. North Korea is close to fully achieving its objective of a nuclear weapons capability and there appears little the international community can do to stop it. Nonetheless, a story of great significance is bubbling up in the DPRK beneath the veil of high politics. North Korea is in midst of significant transformative forces, driven by top-down government economic measures, grassroots entrepreneurialism, Chinese foreign investment, and Pyongyang’s growing interaction with international environmental treaty regimes. These developments present opportunities for the international community to engage with the North Korean government as the Kim regime grapples with dynamic social forces over which it has limited control. Apartments along Chongjang Street in Pyongyang, a visible sign of the new wealth accumulating in the DPRK. In terms of economic policy in the DPRK, two key developments have occurred under Kim Jong Un’s leadership: a burgeoning export trade in natural resources, and hints at tentative structural changes to specific sectors of the economy. The DPRK has a rich endowment of mineral resources including substantial reserves of anthracite and bituminous coal, which have become a lucrative foreign currency earner, and a deposit of rare earth metals of disputed size. Chinese state-owned companies began growing investment in North Korea’s mining and resource sector from 2005, accelerating rapidly from 2008. The timing of this acceleration coincides with a renewed focus from the North Korean government in developing the mining sector as part of its kangsŏngtaeguk (“strong and prosperous country”) program for economic development. Together, the simultaneous and symbiotic goals of nuclear weapons and economic development have become known as the Byungjin Line. As part of its Byungjin Line policy of parallel economic and nuclear weapons development, the government has shown increasing interest in emulating the special economic zone (SEZ) development model pioneered in China under Deng Xiaoping during the 1980s. 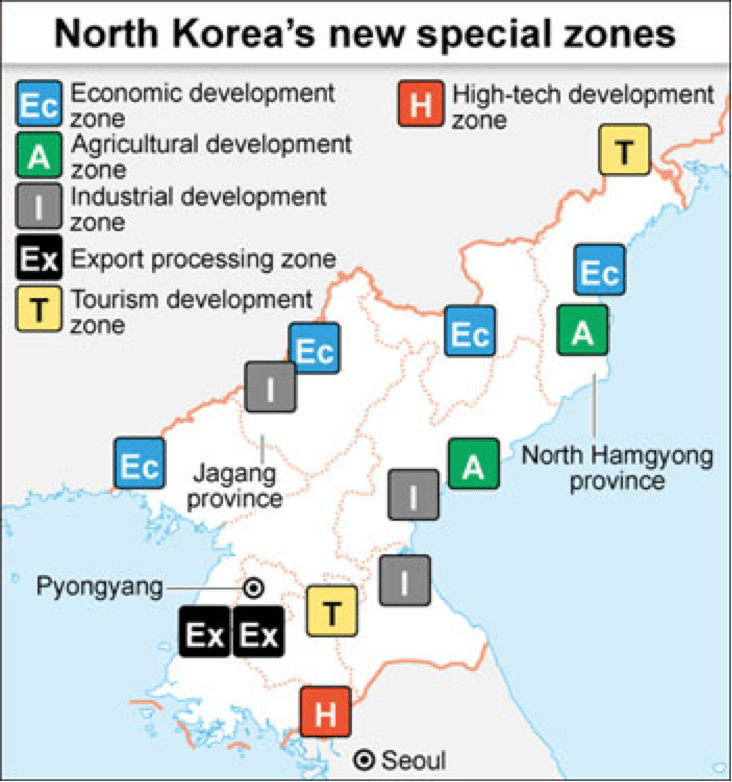 North Korea established its first SEZ in Rason during the early 1990s, near the tri-border area with China and Russia. There is significant Chinese and Russian investment activity in Rason, which requires joint venture partnerships with local entities. The Rason SEZ is linked to Russia’s Far East development strategy and is also helping the Chinese government realise its development goals in Jilin Province. In addition to Rason, there are three other major special economic zones in the DPRK: Hwanggumpyong and Wiwha Islands Economic Zones, the Kaesong Industrial Complex, and the Mount Kumgang International Tourism Zone. 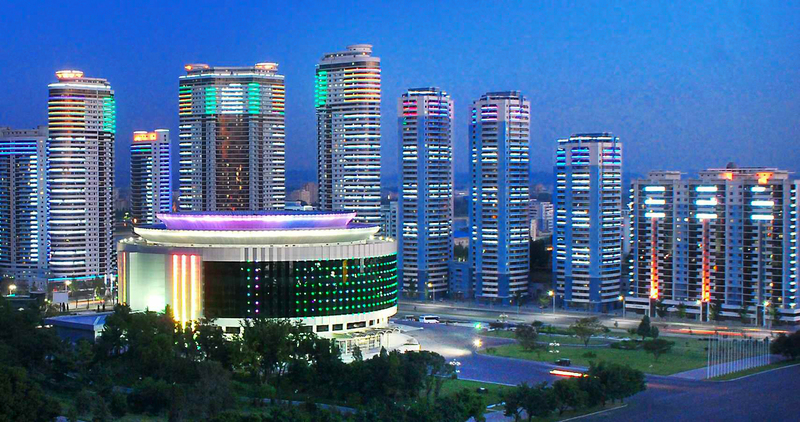 In October 2013, the government announced the establishment of fourteen new city-level economic development zones around the country, building on relative success of Kaesong and Rason. However, foreign direct investment in North Korea remains inhibited by an unreliable investment climate due to limited legal protections for foreign investors, poor infrastructure, and political uncertainties surrounding the nuclear issue. The Chinese government has strongly encouraged DPRK to move down the SEZ-led economic reform path, a model which was pioneered in China during the 1980s under the leadership of Deng Xiaoping. Because of UNSC and bilateral American economic sanctions, Chinese companies have been best positioned to invest in North Korea’s SEZs, investment challenges notwithstanding. Socio-economic forces percolating from below have also reached a critical stage of evolution in the DPRK. The rise of a class of nouveau riche North Koreans – the Donju (“money masters”) – is changing the dynamics of the nation’s economy and reshaping the relationship between the Kim government and the North Korean people. The Donju evolved from the grassroots entrepreneurial activity that arose during the famine period in the mid-1990s. They started out as people trading consumable goods in private markets, who then built up enough savings to invest in more substantial business ventures such as billiard halls or karaoke rooms. Restrictions on such activities have relaxed through the 2000s. Often these individuals had access to foreign currency through relatives or through other activities which, together with their business ventures, helped them amass private savings. In the past, every time this nascent middle class has risen to a certain level, the government interpreted a potential political threat and tried to strip their economic power. The infamous 2009 currency revaluation was one such attempt by the government to devalue the currency holdings of this group and mute in an effort to subdue their economic and political influence. However, the Donju class has now reached a size where such interventions are not quite so practical. Today, the Donju have acquired a degree of wealth where they can invest in larger enterprises. A de facto alliance has evolved between the government and members of the Donju to finance some of the development activities that the government is struggling to finance itself. Yet the Donju’s political impact does not end there. Pressure for political change in North Korea may grow when the size of this nouveau riche class reaches a size where they may become an agitating force if their newly acquired social position becomes threatened – either by government interference or an unforeseen shock event. The destructive nature of shock events lingers vividly in memory of North Koreans through their lived experience of the inter-related natural disasters, famine, energy shortages and economic collapse during the Arduous March period of the mid-1990s. It is therefore unsurprising that the North Korean government has looked to international environmental treaty regimes to address these vulnerabilities and plug holes in the matrix of the economy. Where capacity-building is concerned, there is a strong congruence between the over-arching goals of environmental treaty regimes and the systemic consolidation needs of the North Korean government’s kangsŏngtaeguk and Byungjin policies. The confluence of the transformative social forces discussed above and the convergence of interests between Pyongyang and international environmental treaties is creating a window of opportunity for the international community to influence the North Korean state, if external players are willing to adopt a more holistic view of security. In comparison with conventional security and nuclear politics, environmental engagement with is relatively depoliticised. Carefully nurtured cooperative relationships have developed over time between UN agencies, NGOs and the North Korea government which are potential vehicles for enhanced confidence-building measures. Both the Lee and Park administrations made rhetorical commitments to further environmental cooperation with the DPRK. In addition, sophisticated South-North “green détente” proposals have emerged from sections of the policy community in Seoul. However, Park Geun Hye’s government has cooled on the idea because of fears that food and energy-related capacity-building assistance could bolster the North Korean military, rather than help ordinary North Koreans. An engagement opening in the environmental policy realm could have implications for the human rights strategy advocated by the UN Human Rights Council’s 2014 Commission of Inquiry report. The report is valuable as a systematic and comprehensive catalogue of evidence documenting human rights violations perpetrated by the DPRK government against North Korean citizens. Chief among its recommendations are that “the international community must accept its responsibility to protect the people” of North Korea through a “human rights up front” strategy, which would demand that UN agencies working in the DPRK limit assistance without demonstrable changes in human rights practice from the government in Pyongyang. While meritorious as a strategic intervention specific to the human rights issue domain, the human rights up front strategy could potentially compromise any future efforts at environmental engagement because it is predominantly the UN agencies working in the DPRK that are delivering the capacity-building assistance available through international environmental treaty regimes. This hypothetical example illustrates the conflict over engagement trajectories between advocates of humanitarian work addressing immediate survival needs of North Korean people versus advocates of a more punitive human rights campaign against the North Korean government. At the same time as grassroots forces are altering the relationship between the North Korean state and its people, the government has embarked on cautious economic reforms. These are opening the country to foreign capital and expertise. The firewall isolating the people from information about the outside world is also more porous than in the past. So in the absence of a credible “big stick”, attempting to foster evolutionary social change through economic and environmental engagement may present another option to improve the human rights situation. This is not to downplay the pain of those North Koreans who have suffered horrendous abuses, or excuse the perpetrators of these abuses. But it is important to recognise the impact of the burden of history and the transformative influence of emerging social forces as we consider pragmatic policy responses. The North Korean government is riding the tiger of transformative social change. How long it can hold on may be the most important story coming out of the DPRK in 2015. This article was originally published by MUNPlanent. See original article here.